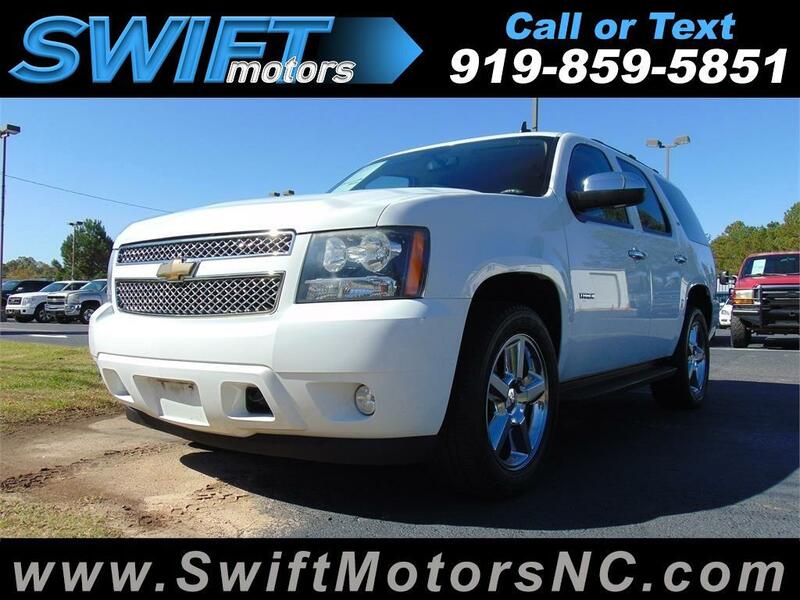 Used 2010 Chevrolet Tahoe LTZ 4WD for Sale in Raleigh NC 27603 Swift Motors Inc.
1 OWNER CLEAN CARFAX! FULLY LOADED! 1 OWNER CLEAN CARFAX! FULLY LOADED! NAVIGATION, SUNROOF, DVD, BACK-UP CAMERA, HEATED AND COOLED SEATS!! Swift Motors, Inc attempts to provide accurate information on the automobile listed above. The actual equipment may vary. Please confirm all vehicle options, accessories and prices with a sales associate to assure accuracy. This information is provided without representations or warranties of any kind, either expressed or implied. Prices do not include additional fees such as government fees and taxes, title and registration fees, finance charges, dealer document preparation fees, and emission testing . Mileage on vehicles might be a little higher than posted due to test drives, so please verify actual mileage. We offer a third party warranty on almost all our vehicles, exclusions apply. Some of these exclusions include but are not limited to; diesels and vehicles over 150,000 miles. Ask an associate for more details. Our dealership does not offer any financing but we do accept loan checks, cash, cashier’s checks, and MasterCard, VISA, American Express, and Discover cards; a convenience fee may apply when using a credit card. We do our best to price our vehicles at our lowest cash price. If you would like to have a bill of sale faxed to a bank or credit union, we will be more than happy to fax over a bill of sale when we are provided the fax number.